Hey there! It's Ashlea, and I'm sharing my first every Hello Bluebird card. Eeeek! This is so exciting. I'm using the Woodland Littles stamp set and if you know my style at all, you'll know that I don't always opt for cute critter cards, but, I'm only human and occasionally have to give in to the cuteness. There were a few different techniques I used in this card so lets get started! 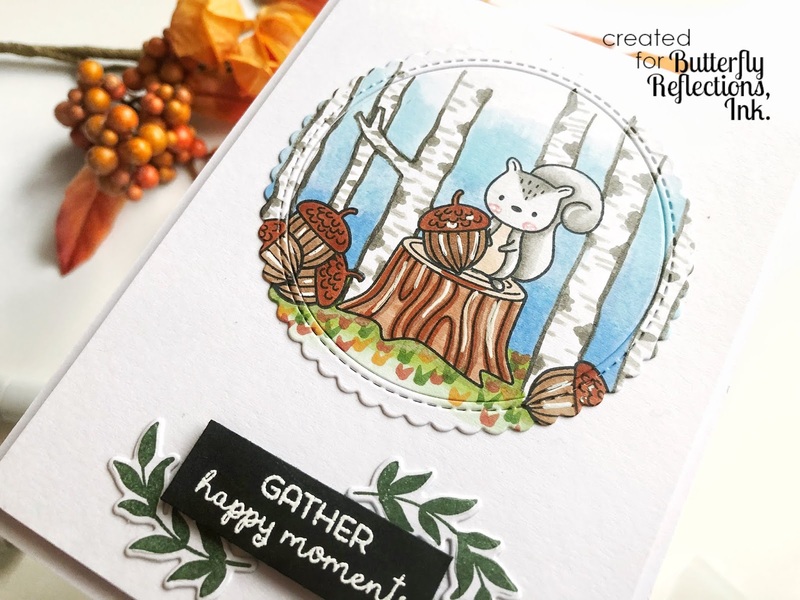 For my scene, I started by stamping what would end up being my "top" image, or the most up front image, which happens to be the acorn on top of the tree trunk. From there, I masked the acorn and stamped the squirrel, then masked that and stamped the tree trunk. I repeated this process with the acorns on the ground as well. I love using masking in my projects to add dimension and interest to a scene. I then hand drew the birch trees which is way easier than it sounds. Birch trees are literally two not straight lines parallel from each other and then smaller lines periodically placed inside of those lines just in a lighter color. Seriously, try it. You'll surprise yourself. After I finished the scene I cut it out using a scalloped circle die. Here's one like the one I used. I then colored everything in using Copic markers, including the sky and grass. I made sure the sky and grass faded out by using my colorless blender on the very edge of the color. 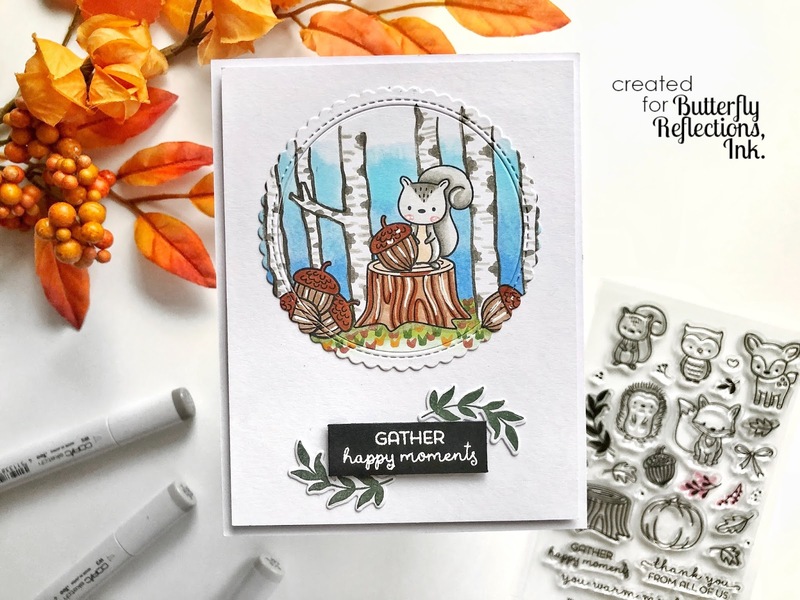 For my sentiment I used the "Gather Happy Moments" sentiment from the set and embossed it in white on a piece of black card stock. To embellish the sentiment a little more I used the solid leaf stamp and cut it out using the coordinating dies. I hope that you enjoyed learning a little more about how I created this scene using the Hello Bluebird Woodland Littles stamp set. 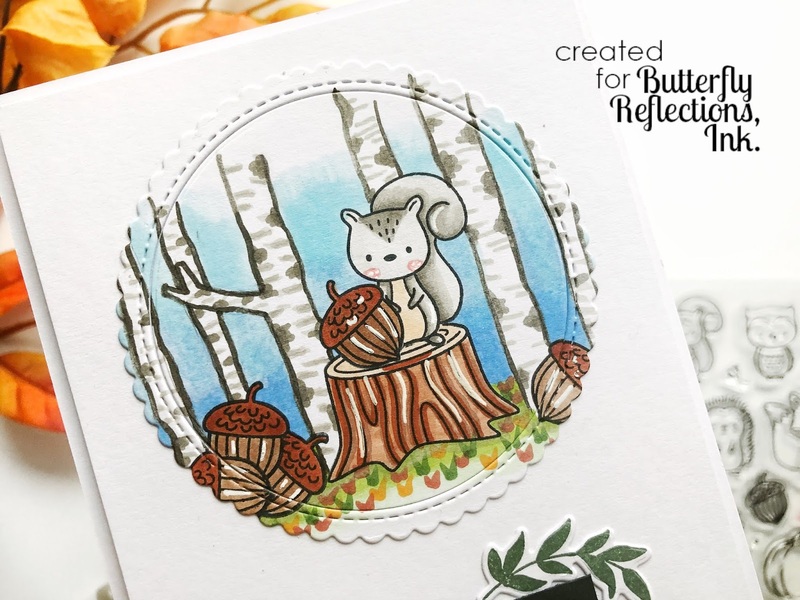 If you love using Hello Bluebird stamps as well, share your favorite project you've made with me in the comments! I'd love to see them. I'll see you agin very soon! Thanks so much for stopping by today!